Our Condition – The fact that we are helpless, ungodly, sinners and enemies of God. The Sinlessness of Christ – Though He was tempted in every way during His days on earth Jesus was without sin. God Made Him To Be Sin – Jesus was made to be the very embodiment of sin. He was made to be all that which is abominable and hateful to God – all that which is the object of His holy and just wrath. The Righteousness of God – Meaning the righteousness of Christ that was lived out in His 33 years on earth. A righteousness that was both holy and wholly pleasing to God. Union With Christ – Jesus is our “representative union” – he acted as our representative in both His sinless life and sin-bearing death. he is also our “living union” – He lives within us by His holy Spirit and empowers us to live the Christian life. Justification – In our standing before God we are righteous in His sight. Not because of anything that we have done but when by faith we trust in Him, God regards us as righteousness because He has credited to us the righteousness of Christ. He sees us just as if we had never sinned and just as if we had always obeyed. Bridges: Suppose you have been working on a job all day and come home sweaty and dirty and your clothes all grimy. What do you need to do before you sit down to dinner? Contractor: I need to take a shower and put on clean clothes. B: How about just putting on clean clothes without taking a shower? C: No I would never do that? B: Then how about taking a shower and putting your grimy work clothes back on? C: No, I wouldn’t do that either. B: So you need to take a shower and put on clean clothes? C: Yes, that’s what I need to do. B: That’s what God does to you. he washes you clean in the blood of His Son and clothes you in His perfect righteousness. Here are some of his thoughts leading up to this summation. 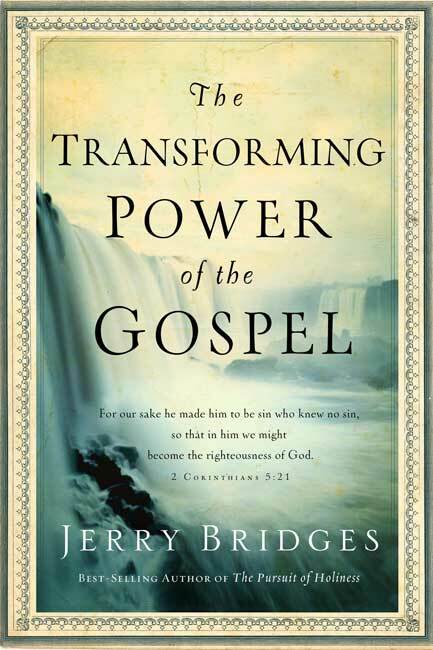 Later in the chapter Bridges gives two great reasons why he is putting such an emphasis on the seriousness of sin. 1) Most Christians, he says, do not take their own sin seriously. “The self-esteem, ‘feel good about yourself’ movement has so infected the church that it is unfashionable to consider ourselves sinners.” Rather, he says, we are people who “make mistakes.” We just don’t take sin seriously. Q1: Spiritual transformation requires dependent responsibility. How does this differ from living by the concept of “Let go and let God”? Let go and let God essentially means that just as you can do nothing for your salvation but trust in Jesus, so you can do nothing for your transformation but trust in Jesus. This is not biblical. Dependent responsibility assumes that while we are dependent on the Holy Spirit to work in us and through us, we are responsible to obey the moral commands and exhortations of Scripture. In other words we can’t expect the Spirit of God to do what He wants to do if we are not willing to put God’s Word into practice and seek to live according to His ways. Q2: If we live in denial about our sin, we will not grow. How does the gospel free us up to honestly face our sin? Because the gospel tells us that, despite the fact that we continue to sin after we are saved, because of the death of Christ God no longer counts that sin against us. And it gives us motivation and courage to daily fight sin that we might more reflect the holiness of our Savior. Q3: Why do believers in Christ still need the gospel everyday? Because the gospel daily reminds us that from God’s point of view, our relationship with Him is not based on how good or how bad we’ve been but upon the perfect goodness and death of our Lord Jesus Christ. And because we are performance oriented by nature, and because our culture reinforces this orientation, we need this daily reminder.